Wait, you didn’t know your favorite cloud service was down? 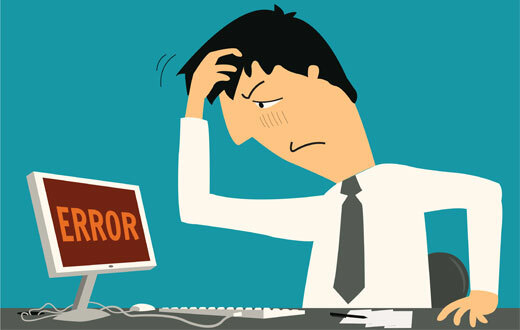 While many of us rely on a negative experience to clue us in that our beloved cloud service is down, there are other approaches we can take to find out. Not surprisingly, a two second internet search on your favorite engine may get you some information. 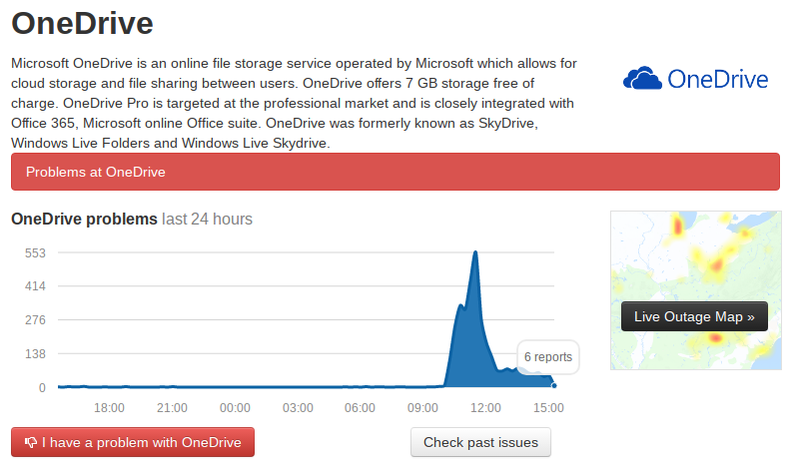 For example, I stumbled on my OneDrive outage pretty quickly! DownDetector tracks more than just Microsoft, though. You can see their complete list here and may be much more effective tool to use than just doing an internet search. Some of my favorites include Amazon, Apple App Store, Blogger (perish the thought that my blog platform would suffer an outage! ), Facebook, Apple Facetime and many more! 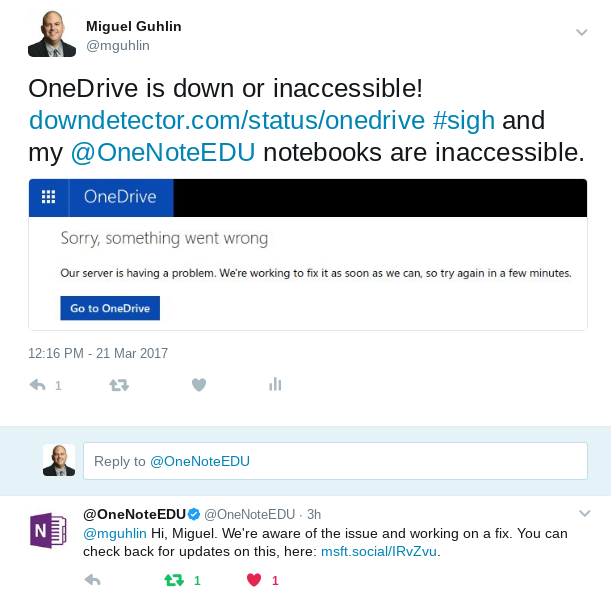 As you can see, OneNoteEDU not only let me know there was a problem, they provided a link to a better source of information! Remember, when there is an outage, it isn’t about yelling and screaming, only an effort to find out what’s going on. You can see I avoided legendary twitter complaint type. My intent and goal was to share my sorrow at being unable to access MONTHS of OneNote notebooks I host on OneDrive…and which aren’t backed up anywhere. A loss of those notebooks would be catastrophic. No matter what service you are using, I suspect that somewhere, somehow, there’s a place where you can go check on the status. 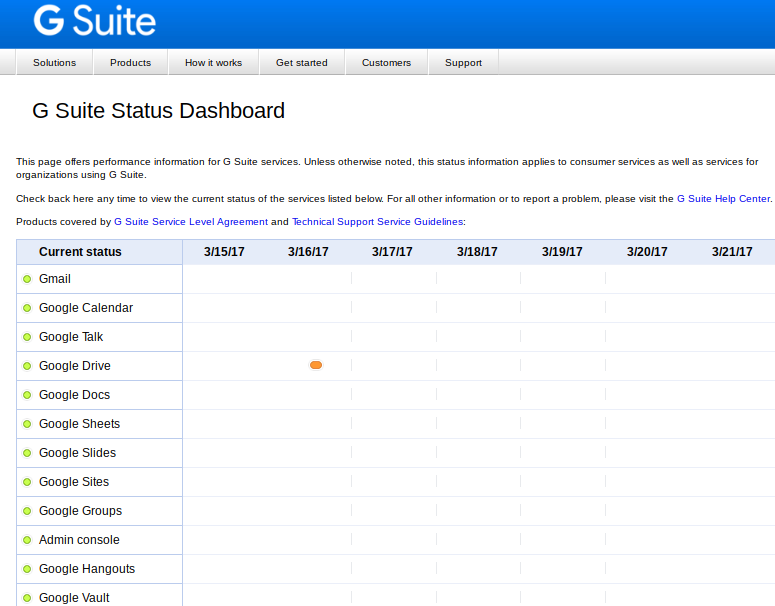 For example, check out these dashboards (click vendor names to view dashboards) from Microsoft and Google Suites, respectively. TCEA Connect! – features all my resources for my work with TCEA.org, a veritable treasure trove for educators! TCEAMEE – This is my Minecraft OneNote notebook. Fortunately, this one is up! MGFolio – This is my ePortfolio,which I decided to put into OneNote because the new Google Sites wasn’t quite up to snuff, and the migration tool (to migrate my old Google Sites ePortfolio) was not yet available. I have to admit that I really like OneNote as an ePortfolio tool. Yay, all’s well that ends well! All my sites are back up again! 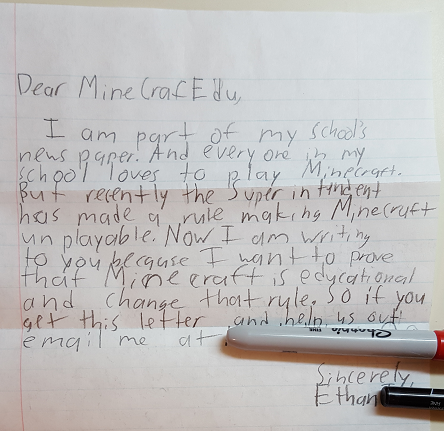 Are you a Minecraft: Education Edition digital native? If so, do we have a treat for you! Take a look at this new video series focusing on introductory videos to everyday tasks in the popular program. These short videos walk you through some common tasks, such as changing a skin, finding materials in creative mode, as well as using the compass and map and mastering the teleport command. One of my favorite activities involves asking participants to narrate their own Three Little Pigs story using Microsoft Office Mix. One fun activity involves building straw, stick, and brick houses. In this Minecraft video series, you will learn what you need to know to re-create this famous story. Note: Notice a young voice? I’d like to thank James E. Guhlin (@jguhlin) for his work creating these video tutorials. You can follow his regular Minecraft video creations here. These videos are intended for teachers to learn some of the simple things they need to know to get started and offer an easy entry that scaffolds your efforts. Need more support? Several professional learning opportunities are available! 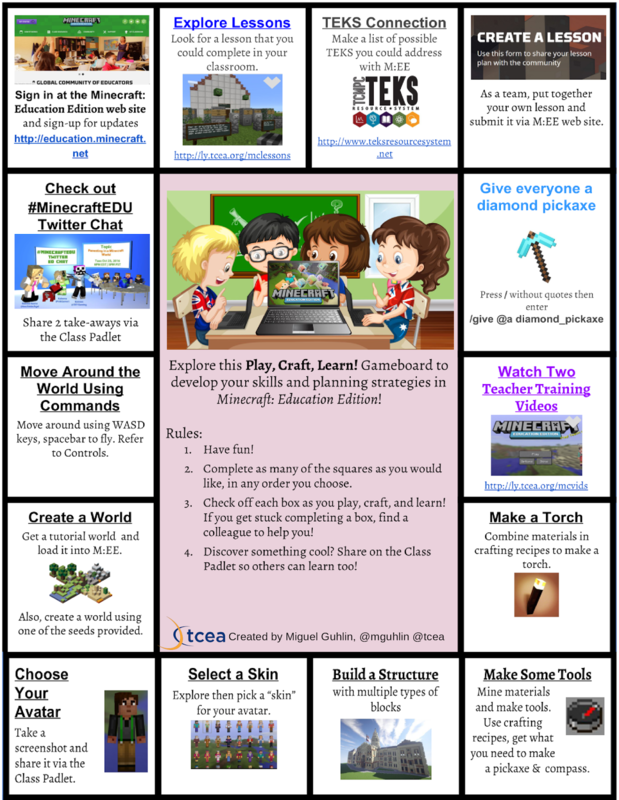 Be sure to check the TCEA Minecraft: Education Edition (TCEAMEE) Professional Learning resources. “How might you shape your space to foster creativity and learning for yourself and others?” asks University Innovation Fellows (@uifellows) via this presentation slide. At its most effective, early childhood curriculum expands children’s knowledge of the world and vocabulary. Such curriculum makes investigating real topics and events meaningful for children. And it instills a desire for question making and the use of literacy skills to explore the world around them. Ultimately, it invites them to be co-creators. Knowing how to shape the spaces we inhabit remains a human imperative. Early childhood educators can both shape the physical and virtual spaces students work in. With Minecraft: Education Edition, they can invite children to shape the virtual spaces in ways that the physical space cannot. Designing learning spaces converts impersonal spaces into learning-friendly ones and moves far beyond throwing a carpet down in the corner reading center. How can we coach students and help them create virtual spaces that are learner friendly? Whether in Second Life or Minecraft: Education Edition, as students become architects, how will physical space design principles transfer into the virtual world? One approach involves having students simply copy the physical space design. Minecraft: Education Edition explores re-designing classroom learning spaces. Who hasn’t looked at the flat world in Minecraft: Education Edition and felt a sense of awe at the creative possibilities? How do we help students go out and create a world? If you are balking at how to get started with designing in Minecraft: Education Edition, you may want to take advantage of seeds. Source: What are Minecraft seeds? For example, to obtain the village shown below, I located a Minecraft seed that works on the Pocket Edition of Minecraft (and also with the Minecraft: Education Edition). “Less is more,” some say. Ensuring students learn how to design virtual spaces may be one of the next big challenges they face online. 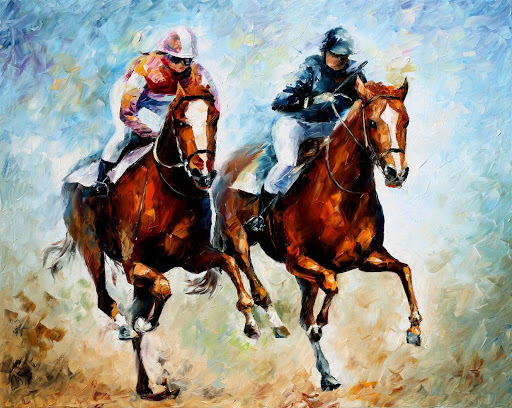 Begin with the end in mind and consider the tips referred to in this blog entry. Over the last few months, I’ve been learning as much as I can about Minecraft: Education Edition, in the hopes of sharing it with others. I am continually amazed at the creativity and resourcefulness I encounter centered around Minecraft. So, part of my learning process has been to write and reflect on what I’m learning. Upcoming #MinecraftED TwitterChat on Tuesday, January 24, 2017: Join the crew for a chat! The topic is Professional Learning with Minecraft or something like that. What kinds of questions do you have about enabling professional learning for staff and students with Minecraft: Education Edition? This blog entry is a “round-up” of what I’ve written or create relevant to Minecraft: Education Edition (M:EE). A part of me was curious as to what I had written and I wanted to see it in a rush rather than wait for a slower publication schedule. It’s not exhaustive list of all the great things you could ever know. Rather this thimble-full of knowledge is just my poor attempt to share what I’m learning as I’m learning it. Thanks for reading and sharing. I hope it may be useful to someone else, but if it’s not, that’s OK, too! Acknowledgements and Appreciation: I would be remiss if I didn’t thank TCEA.org, Microsoft and the Minecraft: Education Edition folks for their support. Learning would not have been possible without their support. Thanks! Be sure to check out their web sites and blogs. Wow, so that means I’m two short of ten articles on Minecraft, although strictly speaking, I need 5 more articles since three of these are really how-to, or illustrated walkthroughs! Note: Links above will become active once respective blog entries are published. Sigh. “How might you shape your space to foster creativity and learning for yourself and others?” asks University Innovation Fellows (@uifellows) via this presentation slide. At its most effective, early childhood curriculum expands children’s knowledge of the world and vocabulary. Such curriculum makes investigating real topics/events meaningful for children. And it instills a desire for question making and the use of literacy skills to explore the world around them. It invites them to be co-creators. Early childhood teachers can both shape the physical and virtual spaces students work in. With Minecraft: Education Edition, they can invite children to shape the virtual spaces in ways that the physical space cannot. Designing learning spaces converts impersonal spaces into learning-friendly ones and moves far beyond throwing a carpet down in the corner reading center. Whether in Second Life or Minecraft: Education Edition, as students become architects, how will physical space design principles transfer into the virtual world? One approach involves having students simply copy the physical space design. Minecraft: Education Edition explodes re-designing classroom learning spaces. Who hasn’t looked at the flat world in Minecraft: Education Edition and felt a sense of awe at the creative possibilities? How do we help students go out and create a world? Blended learning, coding, wearable tech, robots, artificial intelligence, and 3D printing remain hot, new trends for the near future. These technologies are already beginning to converge. One catalyzer that is making convergence possible in K-16 circles is Minecraft. How do these trends align to classroom instruction that works in virtual learning spaces? Did you know? TCEA is offering Introduction to Minecraft workshops throughout Texas? The first is January 23, 2017 in Pittsburg (Area 8). The second is February 27 in Edinburg (Area 1), and another is on March 31 in Victoria (Area 3). Online course offerings will also soon be available! Sign up now to learn with a Minecraft Certified Trainer. Marzano’s research studies find that the effect of classroom practices on student learning are significant. Learners can use Minecraft as a future trends sandbox, disguising learning as play with 3D printing, coding, making, Internet of Things (IoT) control, and virtual learning space design. 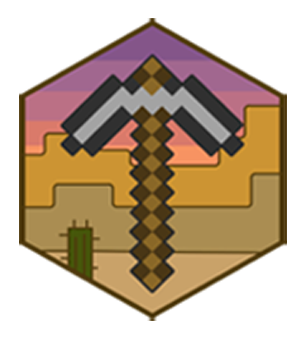 A wealth of work exemplifying Minecraft: Education Edition exists online, often the creation of self-motivated students across the globe. These students represent a growing expertise that shapes top Gartner group trends. Summarizing and note taking 34% Coding and content creation In anticipation of creating a literature scenario or project in Minecraft, students must distill information into a concise, synthesized form and focus on important points. This is exactly what students do when they deconstruct fairy tale elements, script events as for a play, and then create the sets, characters, and portray the story in Minecraft. For example, constructing a building in Minecraft may require coded commands. Students become effective learners as they retell a fairy tale in Minecraft. Reinforcing effort and providing recognition 29% 3D printing Student achievement can increase when teachers show the relationship between increasing effort and achievement. One approach often employed with Minecraft involves creating a class effort rubric that shares a common definition for effort. This can involve defining whether a Minecraft student creation reflects the key elements of the rubric. View one example online and many others here. Homework and practice 28% Makerspaces Re-constructing a historical site over time in Minecraft enables students to break down complex processes (e.g. architecture, planning, building to scale, geometry) into smaller bits. Consider the Crafting the Past Minecraft project as one example of this effort. Per the website, “In order to create the most authentic experience possible, archaeologists have been working alongside gaming experts since the beginning of the project.” Students can do homework to practice how they might create project aspects and then demonstrate divergent strategies to a group in class. Nonlinguistic representations 27% Makerspaces and blended learning When students make virtual, 3D creations, as well as other types of non-linguistic representation, they create visual models of their thinking. They are able to organize key concepts in a visual way, as well as gain a better understanding of geometry. After creating visual structures, students can use their creations to better organize their ideas. See more ideas here. Cooperative learning 27% 3D printing, drones, and robotics Working together to design and create a 3D printing object in Minecraft serves as one example of cooperative learning. Students can plan a creation, execute it in Minecraft, and then print the result. Take a look at this video example. 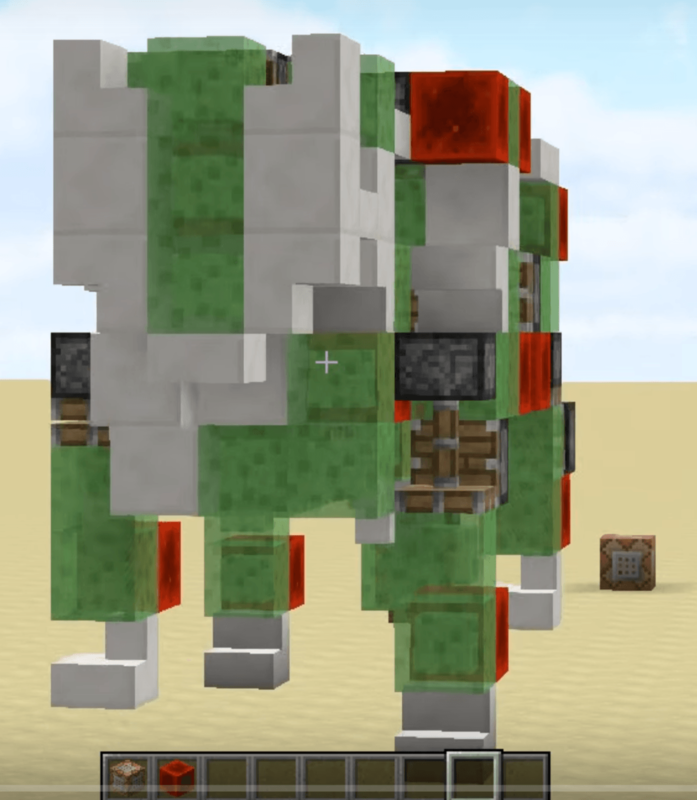 Robots can also be created and controlled in Minecraft using command blocks. The same can be done with drones. Generating and testing hypotheses 23% Coding and the Internet of Things In Minecraft, students can employ Redstone to create simple programs, as well as more complex ones, to achieve desired results in virtual space as defined online. Minecraft’s Hour of Code also provides examples for students to learn to control objects and make visible their thinking. *Adapted with Minecraft examples by Miguel Guhlin from a chart available online here. Read full report, What Works in Classroom Instruction, featuring effect size online from McREL. While few can predict future trends with any degree of certainty, new technologies are converging and finding their way into virtual spaces and worlds. Minecraft serves as one technology that makes creating and controlling other technologies easy with minimal expense. 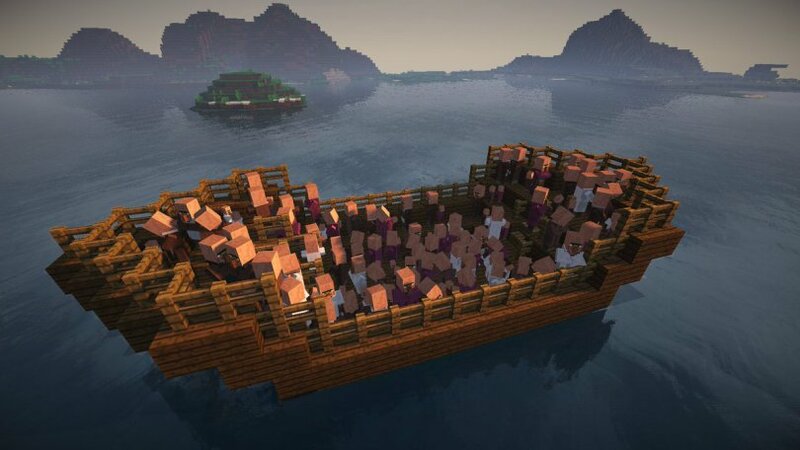 With proper scaffolding, Minecraft activities align to Marzano’s classroom instruction that works research. The goal is to setup Classroom Mode so that you, as teacher, can take advantage of various controls to organize the world and people there. 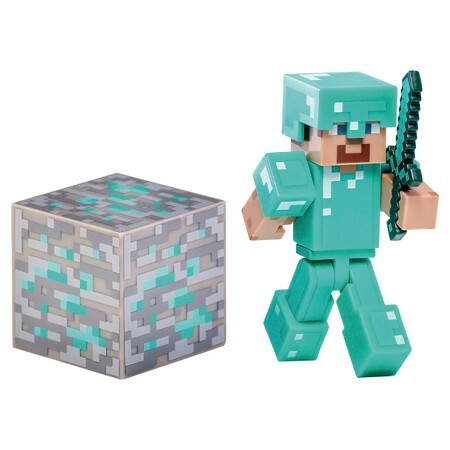 A dedicated computer to serve as the Minecraft: Education Edition server. You will set it up in Step 1 shown below. Setup a Minecraft: Education Edition World to run as Multi-Player. a. Modify your new world settings as you like then click MultiPlayer, as shown below. This will become the machine, a.k.a. “server,” you and others can use to connect to. b. Verify that the computer is setup as a server on the Local Area Network (LAN). Do that by going to another computer and running Minecraft: Education Edition on it. Then, click on FRIENDS and select the server you setup. Once the M:EE Server is setup, you can run Classroom Mode to connect to it and control it. Let’s do that now. Classroom Mode will be used to control the class Minecraft world you setup in Step 1. Follow these steps below to get Classroom Mode working on your “teacher” computer. b. Copy/Paste this command in the command prompt. If it works, you’ll see the words OK as a response. Notice that the server titled “MiguelG” at IP address 192.168.90.85 has 2 users out of 30 possible users connected. Go to http://education.minecraft.net/get-started/ and click on green “I’M AN EDUCATOR” button as shown in the box below. Note that you if you do not have an Office 365 school email account, you can get a free one using the link shown (or just click here). Once you have entered your information, click on the “GET STARTED” purple button. Minecraft: Education Edition general availability – this version of Minecraft: Education Edition is now supported by Classroom Mode in addition to the classroom collaboration tools unveiled during early access, Camera and Portfolio, Chalkboards, Border Blocks, Allow/Deny Blocks, and NPC creation. Students will also have access to a variety of free in-game skins to customize their learning experience. 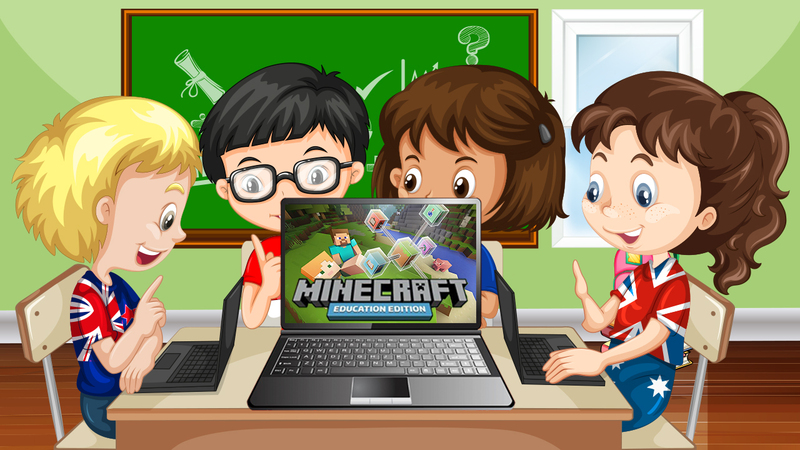 Minecraft: Education Edition is available for purchase by schools, colleges, and universities for $5 per user, per year, or through your school’s volume licensing agreement. Click on the blue “Download” button. The file is 218 megs in compressed ZIP format. 3. Read the Installation Instructions.txt to install the app on each computer. This folder contains an installation program (script) that will install Minecraft: Education Edition on this computer. Anyone with a Windows account on this computer will be able to use Minecraft: Education Edition. 1. Download the Minecraft installation file, named MinecraftEducationEdition.zip. 6. Go to each Windows 10 computer, open the MinecraftEducationEdition folder, right-click the InstallMinecraftEducationEdition.bat file and select Run as administrator. Once the download is complete, you can unzip it and install it as an administrator (right-click on installer bat file). You will need to have your Office 365 account info handy. Note: This blog entry originally published at TCEA TechNotes blog. Reading my Flipboard earlier this month, I ran across a fascinating twitter exchange between Stephen Reid and Tom Bennett. You can find source materials at the bottom of my blog entry. Curious, I decided to dig in and explore some more. As I reflected more and more, I realized that it was all too simple to label gaming a gimmick. And, when I think of Minecraft as a learning platform, it is NOT about capitalizing on student motivation. Rather, it involves asking the same question that we should ask of any technology seeking entrance into our children’s learning spaces–how does it enable learners to accomplish what had previously been impossible? See full-size chart and slideshow this was clipped from. I don’t want to be disrespectful. Let’s have fun exploring inconsistencies and ideas! My purpose for writing this blog entry is to explore my thoughts about Tom Bennett’s points and share them with the world. If they are crazy wrong, then please push back in the comments or leave a link to your thoughts in your blog or podcast. 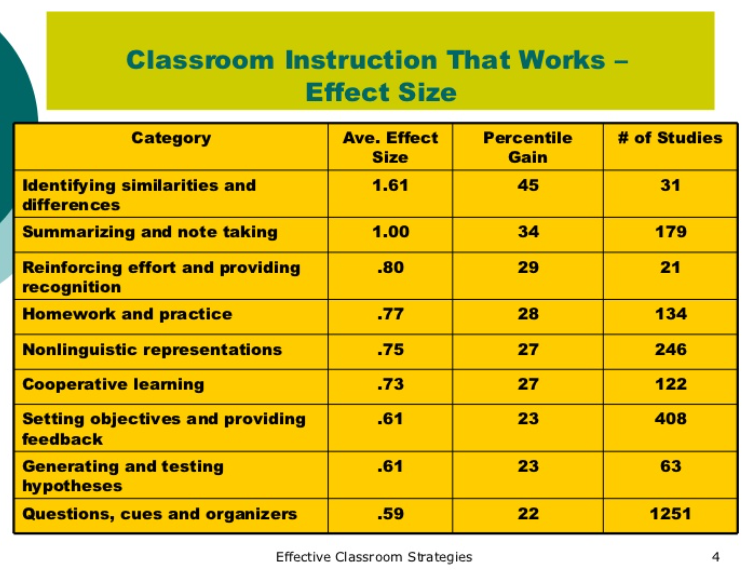 Classroom Instruction That Works describes nine categories of instructional strategies that have a high likelihood of improving student achievement. Source: ASCD’s Classroom Instruction that Works with English Language Learners. Minecraft will get in the way of children learning. We need to drain the swamp of gimmicks and keep schools cost effective. Strip down learning to essential elements. These are valid concerns. Allow me to explore them in turn. #1 – Minecraft will get in the way of children learning. “When we launched Minecraft in our school district, the teacher I tasked with it didn’t really know what to do. In the end, she allowed students to just play the game. When the Superintendent saw it, he questioned why we were still putting money into this initiative.” What a powerful testimony for how engaging gaming can be. . .and a bit of a disappointment, right? Check out Minecraft Refugee Crisis! Have you seen the Empathy Projects? 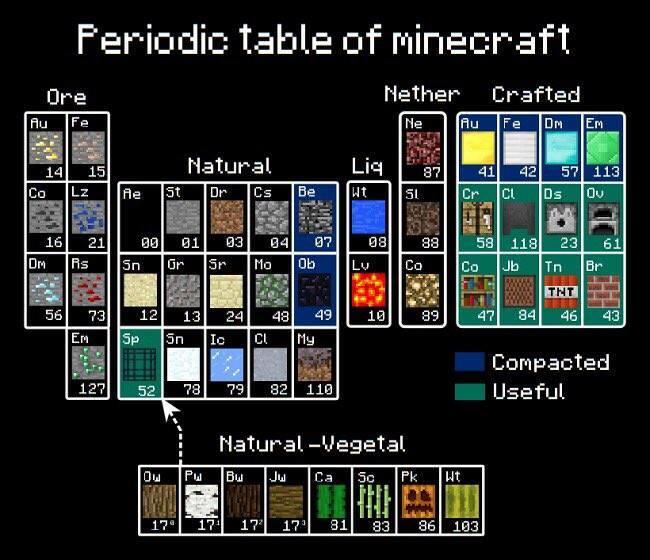 Or, how about the Periodic Table of Minecraft? While learning aligned to the curriculum may not be taking place, it is clear that gaming engages students in a way that brings them to the table. Students are hungry for a different classroom experience. Could Minecraft make that possible? The answer is a resounding, “Yes!” What if we approached learning from a perspective many educators are familiar with, that is, Robert Marzano’s nine strategies? 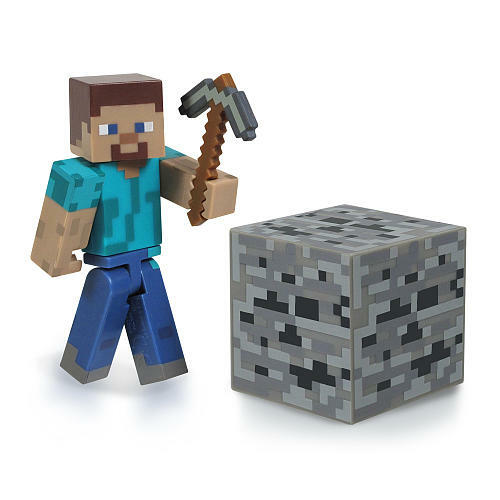 Known as “Classroom instruction that works,” what would activities like Minecraft look like? Kiang’s students start with a text, such as from Harry Potter, then build a structure that externalizes their understanding of the text. In this way, students don’t go to Minecraft to learn, but rather, to show their learning. 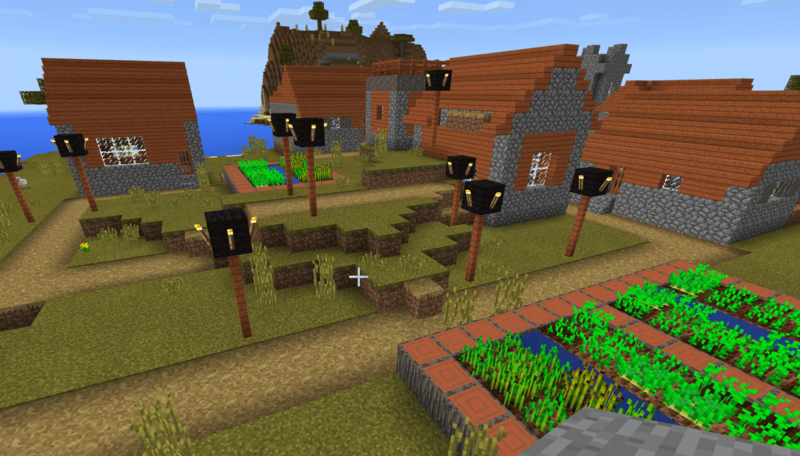 Students, then, are using Minecraft as a way to externalize their understanding. To accomplish this, they have to distill information into “concise, synthesized form and focus on important points.” I was immediately reminded of my work with second language learners and helping them de-construct fairy tales. What’s more, in Minecraft, students can also develop command blocks that help them arrange events as if they were directors and film crew, all rolled into one, to create what a video tales. Students often must divide their labor, collaborating to create objects in 3D. Students can plan a creation, execute it in Minecraft, then print the result. View video example at http://ly.tcea.org/mc3dvideo What’s more, robots can also be created and controlled in Minecraft using command blocks (http://ly.tcea.org/mcrobots). The same can be done with drones (quadcopters, for example) in Minecraft (http://ly.tcea.org/mcdrones) . What does this mean? The value is obvious–students are engaging in cooperative learning in virtual space to create and control objects. Only a short-sighted person would fail to realize that these skills are directly transferable to the world of work and in very short order. Note: If you’re interested in seeing more connections between Minecraft to Classroom Instruction That Works, be sure to grab a copy of an upcoming issue of TCEA’s TechEdge magazine. Or wait a few months and I’ll get around to posting the full version. #2 – Drain the swamp of gimmicks and keep school cost effective. “Why are you buying an expensive computer for him? He’s terrible at math and he’ll never learn to program.” If you’ve been reading this blog long, you’ll realize that those are a paraphrase of what my Mom said to my Dad as he set out to buy me a computer and printer. Fortunately, my Dad did buy me some of those gimmicks. The question, I suppose Tom Bennett is asking, is, “Should government or public school system (taxpayers) pay for fancy experiments that may go nowhere?” The answer is, “Absolutely!” Take a look at these Minecraft creations. Think of how expensive it is to get technology into the hands of American citizens. Our treasure, our sweat and tears should be spent on enhancing the learning and skills of every American. This is especially true as India and China, two colossal nations, outnumber us and are siphoning jobs away. Good for them, but their efforts should spur us to greatness. We need to deploy as gimmicks as possible in today’s schools, and see which fail, which succeed, then focus our efforts. The tremendous expense won’t be in taxpayer funding spent without direct result, but rather in minds that lie fallow because they had to rely on paper and pencil approaches to education. #3 – Strip down learning to essentials. “Sometimes teachers get so wrapped up in the little stuff,” says Jean Etheridge (Education World), “that we need to be reminded of where we are going.” Assuming a minimalist approaches makes sense (of course, it does, right?). Who can’t remember a child with nothing to play with, would invent a game with an iron pot and metal spoon? The question is, as we strip down to essentials, how can we provide the right stuff? 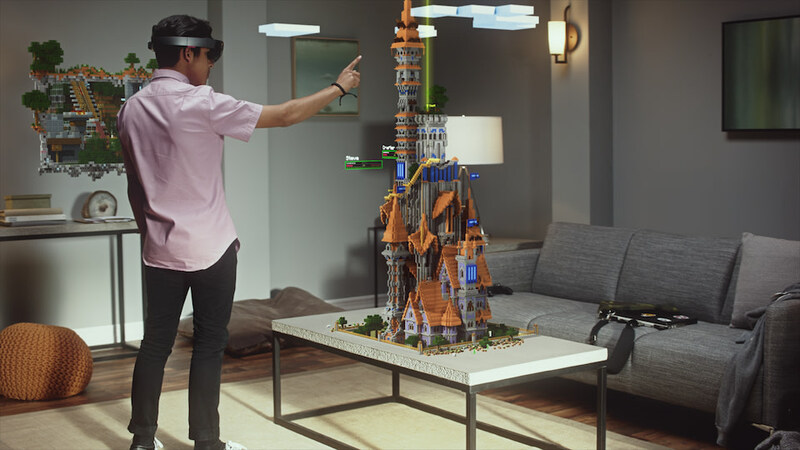 This Digital Trends (@digitaltrends) article points out, “Building their own gadgets can be enormously appealing for kids, but it’s a lot easier to dismantle something than it is to put it together.” I can think of no better gift for a child than Minecraft. A bit slow to the game, I always saw Minecraft through the lens of a game like ID Software’s Beyond Castle Wolfenstein, Doom, Medal of Honor, and Call of Duty. But there’s a lot to be said for building and creating, too. Are you worried that Microsoft is going to make a buck? Well, so did Apple and Google in their time. If you were truly going to get rid of capitalism and go socialist, you’ll deny a fundamental truth. These efforts align to the mission of schools…and help remind us that the goal isn’t for just our children to learn how to do what the technology makes possible. Rather, it is for human beings to imagine what they can create that goes beyond the intended purpose of the technology. Another point to share…I titled this blog entry, Classroom Learning that Works. Probably because “instruction” is so often perpetrated on our children, and they learn in spite of it. Learning implies a bit of self-determination. We probably have to meet in the middle and agree to blend approaches. After all, what we often begin doing because we must may often result in something that we learn to love, and eventually, love to learn. All children are individuals. If they can be reached on an individual level, all the better. Some would say this is gimmicky, displacement learning. This is a perspective if you come at things from a gaming side. Here is another tool that good creative teachers can use. Minecraft has made a staggering amount of it. Schools pay for pencils and iPads and whiteboards. There isn’t a lucrative education market. On November 1, the full version of Minecraft: Education Edition will be available to purchase. For educators interested in trying the new title in their classroom for free before purchasing, the early access version of Minecraft: Education Edition will still be available for free through November 1.
give items and teleport students in the Minecraft world. You can find out more at the Minecraft Education web site. They have tons of great stuff there. While I haven’t been much of a world builder in the past, family members who have spent time and effort love Minecraft. With all the neat stuff you can do (e.g. redstone), I can easily imagine that “Minecraft as a digital lego set” taking education by storm! “Teachers’ experience so far, because there aren’t instructionally validated applications, is that cellphones and the like are only a distraction,” says Robert Spielvogel, the chief technology officer and director of applied research and innovation at the Newton, Mass.-based Education Development Center (Source: Education Week). What a silly perspective. The fact is, schools need to revamp their curriculum efforts because technology and schools are like oil and water unless changes are made. In spite of that disconnect (e.g. creativity vs high stakes testing prep), technology is finding its way into the classroom in the form of mobile devices. The iPad Mini has come out, I’ve held one in my hands, and “Wow!” Yes, I’m impressed by the light, easy to handle iPad Mini. The only drawback is, as you might have guessed, the price tag. Still, the real competition for the iPad in schools isn’t the Google Nexus 7 Android tablet, a wonderful device that represents less of a leap for school district technical support than the iPads which require a Mac for Apple Configurator, iBook Author, and a whole bunch of management nightmare, are intended to be used by only one person at a time (unlike the multi-user Nexus 7). 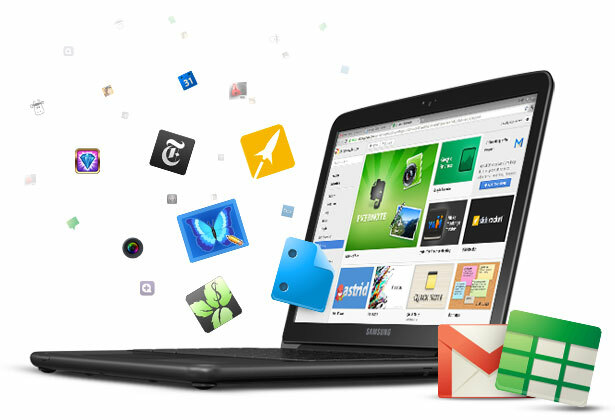 For the techies, the Nexus 7 is a no-brainer device. For the non-techies, the iPad Mini is THE device for the classroom. Having pretty much used it as a laptop replacement, a blogging tool, a video/audio creation and editing tool, as well as copious content consumption, I find myself only missing a keyboard (which goes away as soon as my Zagg keyboard gets turned on and connects via bluetooth). My Response: It’s not a laptop, but it sure can do much of what we imagine a laptop doing with some serious improvements. Let’s not limit the iPad…it’s more than a laptop. My Response: I can’t disagree with this point. The question, is your school an environment where students can find their own way, where individual choice is allowed? and, if it’s not, how do you get there? My Response: Apple’s ability to make things work well together is great, but it also means that we have pay for every upgrade, every change…lightning in a bottle costs money, but brings benefits. His strongest points are the first two, but you’ll want to read the final 2 as well. The third point–Apple Ecosystem–makes me worry, given the point of being locked into their way of doing things. It presumes that Apple will temper godlike omnipotence and omniscience with beneficience (is that a word? In the Apple/Microsoft environment, probably not). Dan McGuire I think 2+ Chromebooks for the price of every iPad casts some doubt on this claim. Bousquet said this was a good way to learn about the Greek culture in a visual manner. “I learned a lot of how through cultural diffusion, the Greeks used the Babylonian Gardens to build their own,” he said. The simple point is that educators, human beings, can be creative no matter what the device. But can they be creative in the schools they find themselves in now?